SOUTH NAGS HEAD AROUND MILEPOST 20 ... AND YOU WILL LOVE IT! TUCKED ONTO A LOOP ROAD OFF OF THE MAIN ROAD BUT STILL WITH THE STREET ADDRESS AS OLD OREGON INLET ROAD *** HOME FEATURES ONE LEVEL LIVING WITH OPEN GREAT ROOM w/ VAULTED CEILINGS w/ SKYLIGHTS * CENTER ISLAND BREAKFAST BAR *** FRONT SCREENED PORCH ... GREAT FOR EATING OUT OR GATHERING IN THE EVENINGS OR GETTING OUT OF THE SUN DURING THE DAY * SOUTH SIDE HUGE DECK ... GREAT FOR RELAXING & ENJOYING THE SUN ... EVEN IN THE OFF SEASON - AS IT IS LOCATED ON THE SOUTH SIDE OF HOME WHICH BREAKS THE NE WIND *** SPACIOUS CONCRETE CARPORT AREA - ROOM FOR 2 CARS BACK TO BACK AND SPACE FOR TABLE AREA TO ENJOY BEING OUTSIDE IN THE SHADE *** CARPORT UTILITY ROOM AND ON THE BACKSIDE IS A SEPARATE STORAGE ROOM * ENCLOSED OUTSIDE SHOWER *** THIS HOME IS SITUATED ON A VERY LARGE ALMOST 40,000 SQUARE FOOT LOT - A PORTION OF WHICH IS THE POND ... 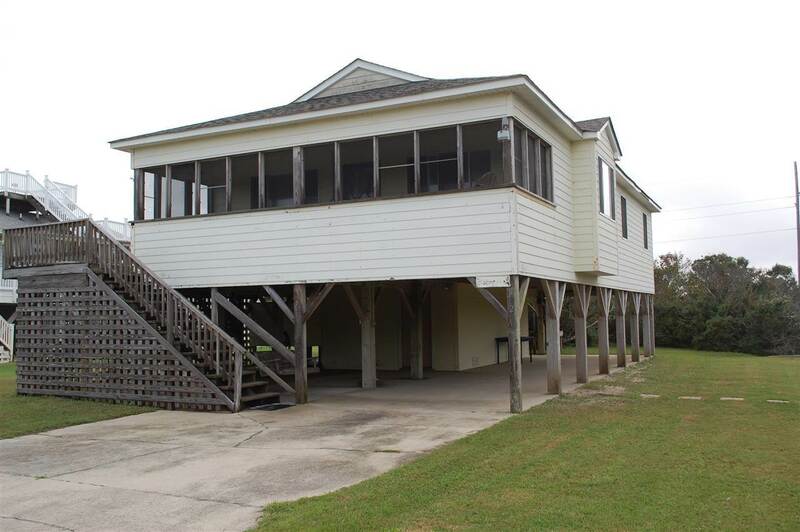 THIS HOME IS SITUATED ON A POND w/ BULKHEAD - FISHING IS A DEFINITE POSSIBILITY! *** HOME ADJACENT TO THE SOUTH IS NEWER AND THEY HAVE ADDED A ROOF LEVEL SUN DECK ... THAT WOULD MAKE A GREAT ADDITION TO THIS HOME ... SOMETHING FOR THE NEW OWNER TO CONSIDER *** HOME IS LOCATED JUST SOUTH OF THE OUTER BANKS PIER & FISH HEADS BAR & GRILL * JUST A SHORT DRIVE TO OREGON INLET FISHING CENTER & THE NEW BRIDGE UNDER CONSTRUCTION * ALSO A SHORT DRIVE TO THE TANGER OUTLET SHOPS & NAGS HEAD RESTAURANTS ... AND DOWNTOWN MANTEO *** BEACH ACCESS IS SHORT WALK TO OREGON DRIVE WHICH IS A PART OF THE HIGH DUNES SUBDIVIDION *** HOME IS CURRENTLY A SECOND HOME BUT WOULD MAKE A GREAT WEEKLY VACATION RENTAL HOME AS WELL *** BEACH ACCESS, POND FRONT, GREAT RENTAL POTENTIAL, AND GREAT LOCATION ... COME SEE!